While searching the dry-stone walls and the fields, we can spot rocks used thousands of years ago back in the Stone Age, by the first inhabitants of the island. They lived in small groups in caves, and used as shelters the Spilaio ton Demonon (Demons Cavern) on the Ai Ghiorgis hill of Lagada, as well as other natural formations. Remnants of a village dating back to the Neolithic Age, from 4300 to 3900 BC, were found on the island of Saliagos (situated in the strait between Paros and Antiparos). Its inhabitants were fishermen, hunters and farmers taking delight in adventure. During the Cycladic period, from 3200 BC to 2000 BC, small villages were built in Kastro of Parikia, Drios, Pirgaki, Glifa, Aliki (Avissos) and near Kolimbithres of Naousa. The Minoans come to the island as merchants and close relationships develop between Paros and Crete, from 2000 BC to 1500 BC, but the Minoans don’t leave their mark on the island, despite the fact that Paros was called Minois or Minoa at the time. Over the course of history, the island was called several names such as: Paktia, Dimitrias, Iria, Iliessa, Platia and Kavarnis. Remnants of the civilization were discovered on the koukounaries bulge, near Naousa but also near Paroikia castle. The situation in the Aegean Sea is turbulent due to the movement of several tribes and Paros is occupied by the Arcadians under the leadership of Paros or Parrasios whom the island was named after. The Arcadians intermarry with the newly brought Ionians arriving in the times of Homer. In the 7th cent. BC, the poet Archilochus of Paros is born and Paros turns into an important nautical force. Paros fleet starts travelling and establishes colonies named Parion, in Thassos, Propontis, and Faron in the Adriatic sea. In 600 BC Paros issues its own coins. People worship the 12 Olympian Gods and testimonies of that time can be found at the ruins of the temples of Eileithyia, of Ipatos Dias (Zeus, the Supreme God), of Aphrodite, in Dilion, at the Asklepios and Pythian Apollo temple, on the hills around Parikoia. 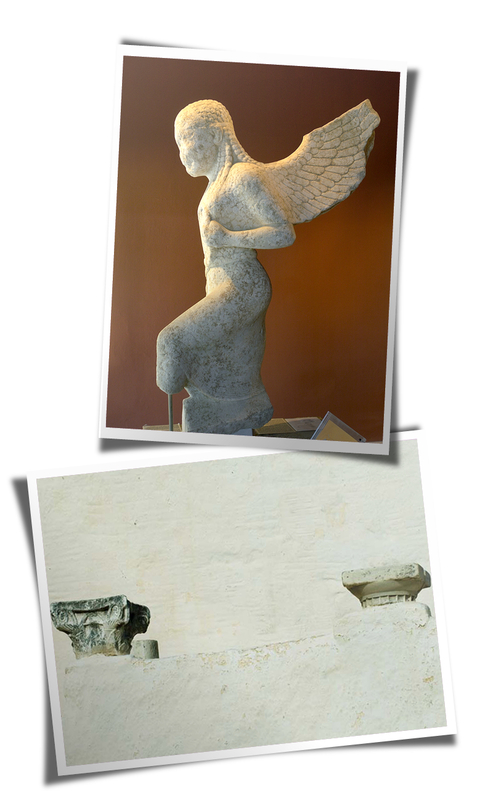 Don’t miss visiting Paros archeological museum which displays exhibits from the past. The marble quarry in Marathi operates intensively. Paros is flourishing both financially and artistically. The Parian marble “lychnites” is extremely popular and many Parian sculptors like Skopas and Agorakritos work on it in their studios and create important works of art. The city of Paros has 50.000 inhabitants and displays magnificent marble buildings including a gymnasium, a theatre and a stadium. In the 3rd cent. BC, Parian craftsmen use the Parian marble to build constructions in Delos, while Milos buys marble from Paros for the construction of the Aphrodite of Milos (the Louvre Museum). The Parian Marble (Oxford England)-a chronicle engraved on marble plates-is compiled. Then decline follows. The Cyclades islands turn into places of confinement where the Roman Empire enemies are sent into exile. 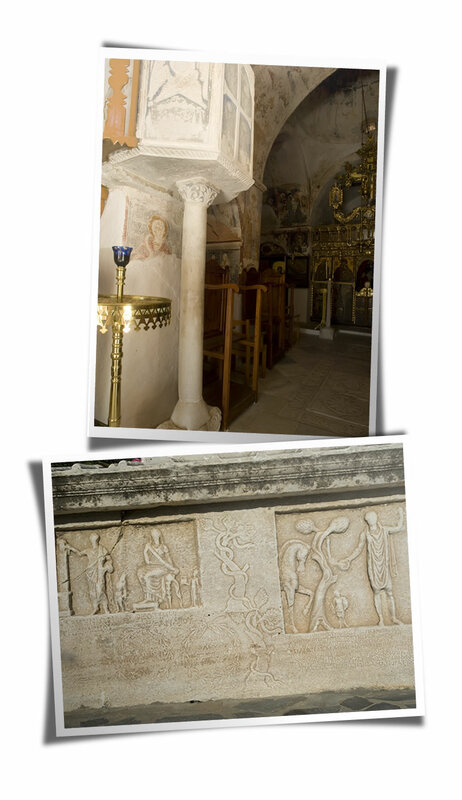 The Byzantine times succeeded the Roman times when the construction of an Orthodox monument, Ekatontapiliani, a church in Paroikia dedicated to Virgin Mary, and the Treis Ekklesies (the Three churches), 1Km away from Paroikia on the way to Naousa, take place. Since the 3rd cent., Christianity has been the dominant religion in Paros. Then Paros comes under the Venetian occupation and remains under the rule of the Sanudo family for 200 years. The family settles in Paroikia where they build their Castle .It is at that time that the Castle of Naousa (also called Kasteli at the village small harbor) and the Castle of Kefalos (on St. Antonios hill in Marpissa) were built. The Parian marble starts travelling again, this time towards Venice, while Paros is once more entering a flourishing period. In 1537, the island is attacked and destroyed by pirates under the command of Barbarossa. The Parians live under the fear of pirate attacks. Some time later they submit to the Ottoman Empire. It is then that new villages are built (Lefkes, Kostos, Marmara). In 1774, the Russians arrive on the island, berth their fleet at St. Kali island, in Naousa and set up barracks, storehouses and small shipyards. Paros becomes the center of the Russian Rule under the Orloff family. .Since then, Paros joins the free Greek State and a great insular civilization starts to develop.When World War II ends, the Parians are forced to migrate first to Piraeus and later on abroad.Around 1970, a new development period starts for Paros, mainly based on tourism.